If you like frozen okra in the winter, just imagine how good it would taste if you had picked a firm, fresh okra yourself and then quickly froze them at home! It is also one of the simplest ways to put up a vegetable for the winter. Here's how to do it, complete instructions in easy steps and completely illustrated. The okra will taste MUCH better than anything you've ever had from a store. Step 1 - Get the okra! Start with fresh okra - as fresh as you can get. If there is a delay between harvesting and freezing, put it in the refrigerator or put ice on it. Select young tender pods and separate into small pods (4 inches or under) and large pods. 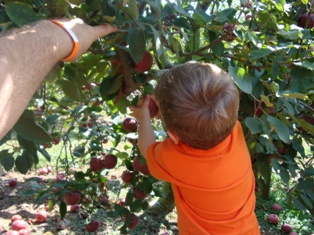 The smooth type varieties freeze as well as or better than the ridged varieties because they do not split as easily. Step 2 - Wash the okra! I'm sure you can figure out how to rinse the okra in plain cold or lukewarm water. Just take a sharp knife and remove the stems at the end of the seed cells, being careful not to expose the seed cell. Prepare quickly, (if you leave it sit cut for more than a half hour, it will start to discolor). Do enough okra for one blanching at a time. Get the pot of boiling water ready (about 2/3 filled). 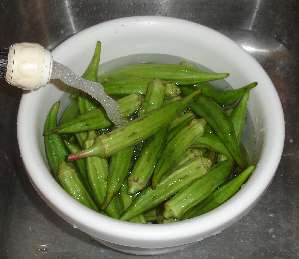 Also get a LARGE bowl of ice and cold water ready to receive the okra after blanching. Step 5 - Blanch the okra. All fruits and vegetables contain enzymes and bacteria that, over time, break down the destroy nutrients and change the color, flavor, and texture of food during frozen storage. okra requires a brief heat treatment, called blanching, in boiling water or steam, to destroy the enzymes before freezing. Cook (blanch) small pods 3 minutes and large pods 4 minutes. 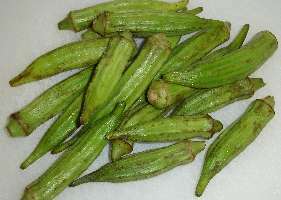 Begin counting the blanching time as soon as you place the okra in the boiling water. Cover the kettle and boil at a high temperature for the required length of time. 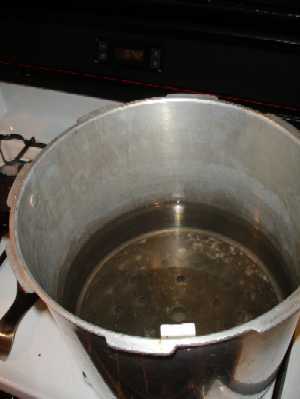 You may use the same blanching water several times (up to 5). Be sure to add more hot water from the tap from time to time to keep the water level at the required height. Remove the okra from the boiling water with a slotted spoon and place in ice water to cool for about 5 minutes (until cold). Drain thoroughly (2 or 3 minutes). You can leave the okra whole or slice it crosswise so it is ready to use. 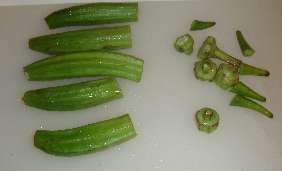 If the okra is watery when thawed, discard the liquid before using. An alternative method is to cook the okra first - using you favorite recipe for a zucchini casserole, or sauteed okra, etc., and then simply freeze the cooked okra! Of course, it does take up more room in your freezer.